Like a real life "Dalek," Dr. Who's robotic nemesis in the British science fiction show, a Texas company's robot is ready to "exterminate." Only this robot, "Little Moe," is trying to exterminate viruses, including perhaps the Ebola virus. "Little Moe" is manufactured by a Texas company called Xenex. The company told CBS News that its disinfection robots are in use in 250 American hospitals, including Texas Health Presbyterian Hospital, where Ebola patient Thomas Eric Duncan is being treated and is in critical condition. The company would not confirm whether their robot was being used in that part of the hospital. The robot uses pulses of high-intensity, high-energy ultraviolet (UV-C) light to disinfect a room. According to company spokesperson Melinda Hart, the robot's Xenon-containing light bulb kills 99.9 percent of dangerous viruses and bacteria in less than 5 minutes. The light can also split open bacterial cell walls to kill dangerous pathogens commonly found in hospitals. 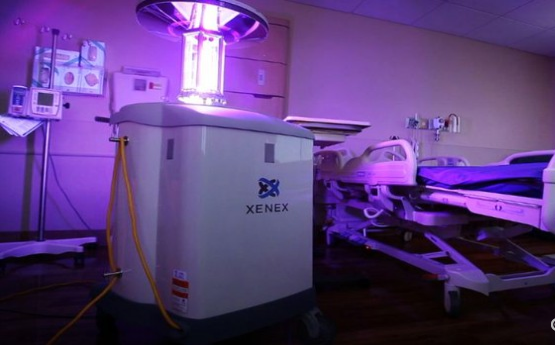 As reported by CBS Houston, Xenex's founder and Chief Scientific Officer Dr. Mark Stibich said these robots can rid a hospital room of germs in 5 minutes and destroy Ebola on any surface in 2 minutes. Hart noted that though Ebola is highly infectious when suspended in liquids, such as a patient's bodily fluids, once that fluid dries up it is relatively easy to kill any remaining virus. One advantage of UV light is that it kills germs without the use of chemicals. But surfaces need to be cleaned of fluids and dust first. UV light adds a final layer of protection. According to Hart, "where we [Xenex] shine is that we destroy anything you can't see." She says it takes only a couple of minutes to kill viruses like Ebola or Norovirus, the bug notorious for spreading gastrointestinal illness on cruise ships; bacterial pathogens that form spores take a couple of minutes longer. The company recommends that hospitals turn all high-touch surfaces toward the robot, then disinfect each side of the bed for 5 minutes each. UV light can harm cells in people and animals. Extended exposure to UV-A and UV-B rays, the kind found in sunlight, cause sunburn and even skin cancer. But rays of UV-C from the sun are blocked by the Earth's atmosphere. When produced artificially here on Earth, UV-C rays can be blocked by a barrier as thin as a plastic bag. The robot comes with a motion sensor that turns itself off if it senses movement in the room while it is at work. Hart told CBS News in a phone call that the robots start at $104,000 and cost a hospital about $3 per patient room to operate. There are cheaper ways to generate disinfecting UV light. For example, mercury lamps have been used to disinfect surfaces and liquids for decades, and the bulbs are only about $100. However, they are 25,000 times less intense than a Xenon bulb and the disinfection process can take hours, making them impractical for hospital use. LEDs could also provide cheaper UV light, but they are also far less intense than Xenon bulbs, according to Hart. Besides hospitals and cruise ships, the company points out that sports teams can use the robots to disinfect team uniforms and equipment. A high school football team that had suffered from an outbreak of staph had their equipment disinfected by a Xenex robot.